Removu K1 Review and Test : is this the new category leader ? Home / Gimbal with camera / Removu K1 Review : is this the new category leader ? 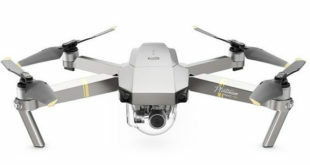 For September, the South-Korean Gopro gimbal manufacturer really wanted to come over as a big player on the stabilizer with integrated camera market. Up until now, the latter was split between the DJI Osmo+ and the Feiyu Summon+. With the Removu K1, which, according to us, will be a real success, the South-Korean manufacturer really confirms that he’s really willing to win many new customers. Bellow, discover our Removu K1 review, as you’ll see, it is really promising ! 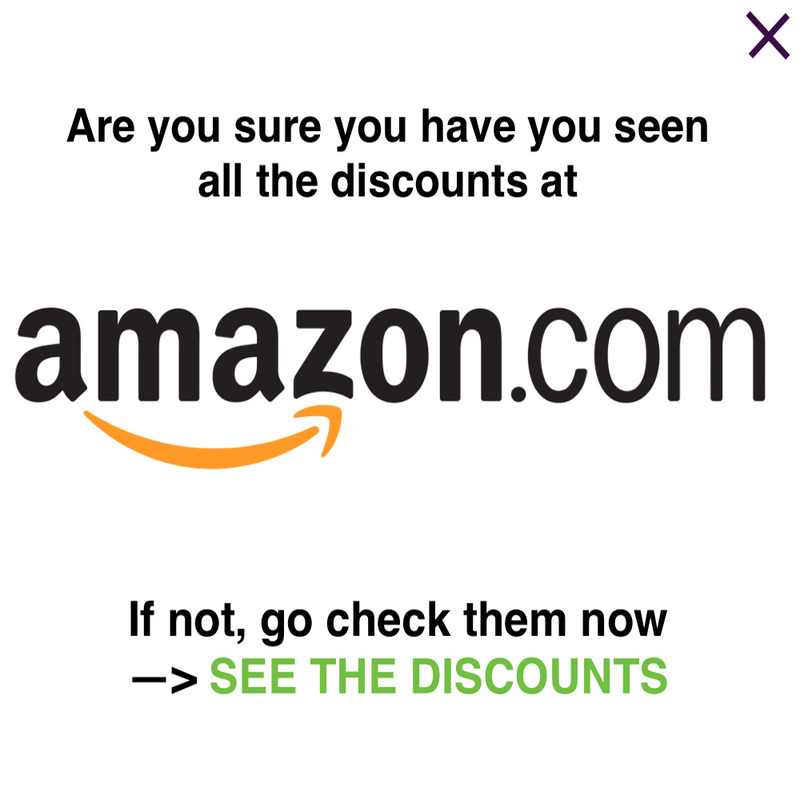 Removu : a brand which deserves to become more famous ! Even though Removu is not the most known brand in the world as far as stabilizer manufacturing is concerned (it is far beyond Gopro, Zhiyun, Feiyu or DJI), it really deserves more visibility with its very good products. Indeed, we told you many times how good the Removu S1, the Gopro stabilizer, was, according to us. As a matter of fact, this is definitely the best Gopro gimbal for the time being thanks to many very great qualities. 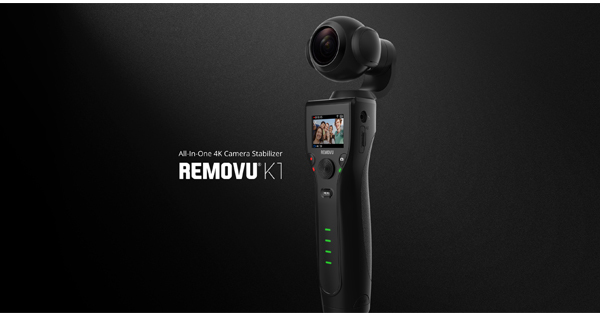 Among them, we can name the water resistance, the insane stabilisation or the fact that you can separate the gimbal from its grip,… The Removu S1 Review was more than positive and we are 100% sure than the one for the Removu K1 will also be, as you’ll be able to read in this article. The Removu K1 review is very positive because it is, according to us, a real flagship product which should, once officially released, please many of its users. As always, our Removu K1 review will try to be as accurate as possible in order to enable you to know everything about this gimbal. Particularly, we’ll put forward all its strengths and weakness(es) in order for you to compare it directly with its two competitors, the DJI Osmo+ and the Feiyu Summon+. For the time being, the information we have leave us with a very good Removu K1 review. Then, we’ll need to test the Removu K1 in order to be sure that it is as good in real that it is on paper. Before everything and without any surprise, it is very important to notice that the Removu K1 offers 3 brushless stabilizers, like its two direct competitors. Therefore, our Removu K1 review will certainly be very positive as far as stabilization is concerned. Indeed, its brother, the Removu S1 was insane as far as this was concerned. The camera which is mounted on this gimbal will enable you to shoot videos in 4K 30FPS which is as good or better than its two competitors. If you want to shoot in 1080p, you’ll be able to do 120FPS and even in 240FPS in 720p for smooth and stabilized slow motions. Our Removu K1 review is also very positive as far as photos are concerned. Indeed, it is made up of a 12M pixels captor for very high-quality photos. You’ll be able to shoot single pictures, burst photos, Timelapse photos (normal AND in motion) or to shoot incredible panorama photos. We can’t wait to present you all this in our in-depth Removu K1 test and review. One more very important thing to look into is the battery life. As far as this is concerned, it looks quite promising as the 2.900mAh Li-on battery should enable you to shoot videos in 1080p, 30FPS during 4 consecutive hours…crazy !! We’ll check that during our Removu K1 test and review in order to see if this very good boasted battery is as good as that in reality. If it is the case, it will be as good as the Feiyu Summon+ and way better than the DJI Osmo+. The latter offers only 1.5 hour of battery life as you can see in our DJI Osmo+ review. We also really like the very light weight of the Removu K1 as we’ll be able to test during our review : 340 grams. Furthermore, its size also make it very easy to take in hand : 5.8*7.0*21.6cm. In order to make the user experience even better, Removu has developed a real good mobile application which will enable you to control quite a few functions and modes on your Removu K1. The application will be available both for iOS and Android smartphones and will work thanks to a 2.4GHz auto-generated Wi-Fi. Among the functions that we’ll look more precisely during our Removu K1 review and test, we can name the Live view (preview of what you are filming), the Playback (watch what you have filmed), the Remote control of the camera and gimbal or the fact that you’ll be able to update your firmware directly from the mobile app ! As you can see on the picture above, the Removu K1 will have a little 1.5″ LCD screen in order to for you to make sure that your videos you are shooting are correct. 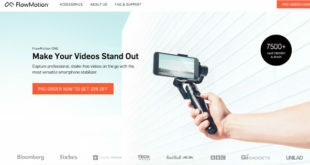 This is a significant advantage compared to the DJI Osmo+ for which you’ll have to connect your smartphone if you want to see what you are filming. Definitely, this is not the more practical way of using a gimbal… Yet, the Removu K1 is not the only one which offers a screen. Indeed, the Feiyu Summon+, for which we did an in-depth review, also offers this very enjoyable solution. Yet, as you’ll see in our Removu K1 review, this is definitely something that will make our experience really great ! Indeed, on the picture above, we can guess how easy this gimbal is to use ! Everything looks simple and sobre. You’ll be able to directly start/stop your videos or to take a photo directly from your grip by hitting one of the two buttons (red for video, green for photo). Thanks to the 5 ways joystick, you’ll be able to make very precise shots for high-quality videos or picture. On top of that, the 4 little green LEDs will tell you how much battery you have left. We’ll have a closer look to all that during our Removu K1 review and test. 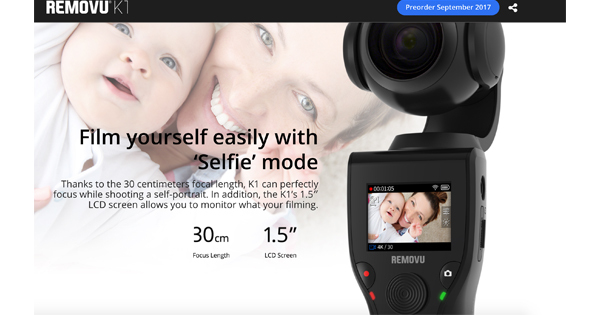 The last very important point is “how much does the Removu K1 costs ?”. According to our sources, it should be very close to 400$ which is quite cheap compared to the 700$ of the DJI Osmo+ for instance. Now, we just have to wait for its official release before we can do our Removu K1 test and in-depth review. One thing is sure, it looks very promising…and we hope that we won’t be disappointed after our test. We also hope that it will be as good as the Removu S1 for the Gopro gimbals ! 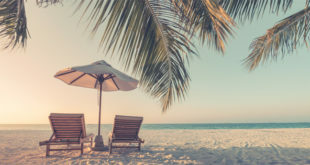 Previous What gimbal stabilizer should you use for Summer vacation ? It accually shoots 1080p at 120fps and 720p at 240fps, do your research.